In April of 2015 the Pocono Mountain Water Forest Community Association launched its new Police Department. 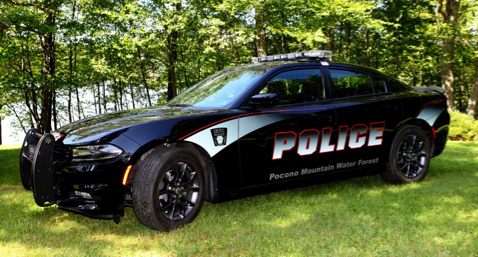 Our Police Department is solely dedicated to the safety and welfare of the Pocono Mountain Water Forest Residents. This means that we are enforcing speed limits, stop signs, and drunk driving as well as patrolling our common areas to enforce drug laws, under age drinking, curfew hours (SEE "OCTOBER 2011 BOARD OF DIRECTORS DECISION" BELOW), and ongoing vandalism. We would like our residents to be fully assured that we will NOT be intruding into what goes on in your home. In the event of an emergency in your home or on your property you will still have to CALL 911 and have the Pennsylvania State Police respond. We believe this program is helping to insure the safety and quality of life of our residents and all that visit our community. We would also like to remind our residents that we are looking for volunteers to support our "NEIGHBORHOOD CRIME WATCH" Program. If any of our residents at Pocono Mountain Water Forest would like to consider putting in some time on the Neighborhood Crime Watch Program, we urge them to call the Pocono Mountain Water Forest Office at 570-686-2989 between Wednesdays and Saturdays from 11:00am to 6:00pm. No matter how much time you could give, it would be a big plus to the community. Even an hour or two a week. And remember that you don't get involved in anything that you might see. All you do is WATCH, REPORT, & DISAPPEAR. You remain completely anonymous. No one will ever know that you are even part of the program. Please get in touch with the office if you are interested in helping your community. We will keep your information completely confidential. Let's make our community a shining example!……………………………………………………………………………………………………………………………..
For a number of years, we have been taking back control of our roads with our gate system. As most of you know people and contractors cut through our community everyday creating more wear and tear on our roads which means more repairs that we are all paying for as a community. Many of these people cutting through also tend to travel at high speeds and are ignoring our stop signs. This of course creates a terrible danger to everyone in our community. Our gate system is having a positive effect on controlling the problem. We are confident that through our gate system program, we will continue to show outside traffic that our community road is no longer an option for cutting through. We would also like our residents to know that we have been, and will continue to prosecute through the Pennsylvania State Police anyone that tampers or destroys any part of the gate system. And Residents should please be aware that they will be held responsible for all costs if they let someone through on their card or beeper and the person being let through damages the gate system in anyway. *The Gate Entrance is for Resident Use Only! All Non-Residents Should Be Directed To Use The Main Entrance On Rt 739.……………………………………………………………………………………………………………………………..
1) It was decided at the October 2011 Board of Directors meeting that there will be a curfew imposed on all common areas of PMWFCA Property from 11:00pm until 6:00am. This decision became effective immediately. The curfew applies to all ages.